Accomodation : The guests can choose from 20 thoughtfully designed rooms that are tailored according to the comfort and convenience of the guests. The rooms offer the views of mountains that make for some blissful time for the guests. The rooms have comfortable interiors and offer genuine warmth and coziness to the guests. The in room amenities of the hotel comprise of direct dial phone, a 21 inch color television with satellite channels and other facilities. Dining : Savor some of the most lip smacking dishes at the in-house restaurant of Hotel Rendezvous in Gangtok. The dishes prepared at the restaurant are simply a delight for the guests and include wide range of Indian, Chinese, Continental, and Sikkimese cuisines. Hotel Rendezvous of Gangtok in India has every solution for the food freaks. 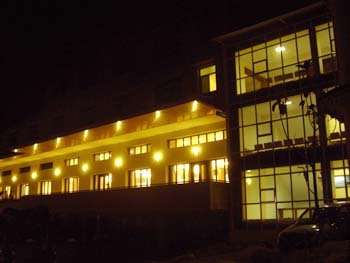 Enjoy staying in what is one of the most reputed Budget Hotels in Gangtok. Hotel Rendezvous has a stress free ambience and provides best of services and facilities to the discerning guests at pocket friendly prices.